We started Purple Pill VR with two people and an idea. Now, two years later, we finished about 15 360º 3D productions, built a fully functioning multi-platform video player application, and expanded the team with 6 extra employees. Things are moving fast, and keep moving faster as the VR market is picking up speed. This blog explains how we try to deal with this explosive growth. When we started out, we had 1 simple production per month… if we were lucky. Now we constantly have several complex productions running simultaneously, all in a different stage of completion. Our heads were overflowing and we kept forgetting things. We realized we had to drastically change the way we manage these projects. The first step was to start using a project management tool to keep track of every task that needed to be done for every project. A friend of mine recommended Asana, a free (up to a certain team size) project management application built by Facebook co-founder Dustin Moskovitz. We started using it and never looked back! We have our RAW FOOTAGE folder where we dump all the files that come from our cams. We organize these camera folders into take folders, then spot which takes we want to stitch, and move those to the SELECTED SCENES folder. This way we always have a backup when we mess up some files for whatever reason. Inside each take we split things up further into subfolders for video, audio, artwork etc. Once we start editing we create a similar structure for the overall project to keep things organized. While the folder structure we just described is nice and organized in theory, in real life there are demanding clients, fast-approaching deadlines, and sometimes utter chaos. It is not realistic to expect employees to work that neatly while they are fighting to meet a deadline at 3am on a Sunday night. Also, we now have several employees and multiple work stations who all need to have access to the same files..
We currently use two Mac Pros attached to two LaCie 5Big 20TB RAID disks for the initial file preparation, and have a powerful Windows render PC with two Nvidia Titan X cards, for a total of 24GB (!) of video memory. And while 2 * 20TB might sound like a lot of storage, we managed to fill them both up in no time… yes, these files we work with are BIG! Our solution was to add a central file server into the mix. A server is expensive, but an absolute necessity once your company reaches a certain size. We went for a cost-effective and easy-to-manage solution using a Mac Mini in combination with OS X Server. 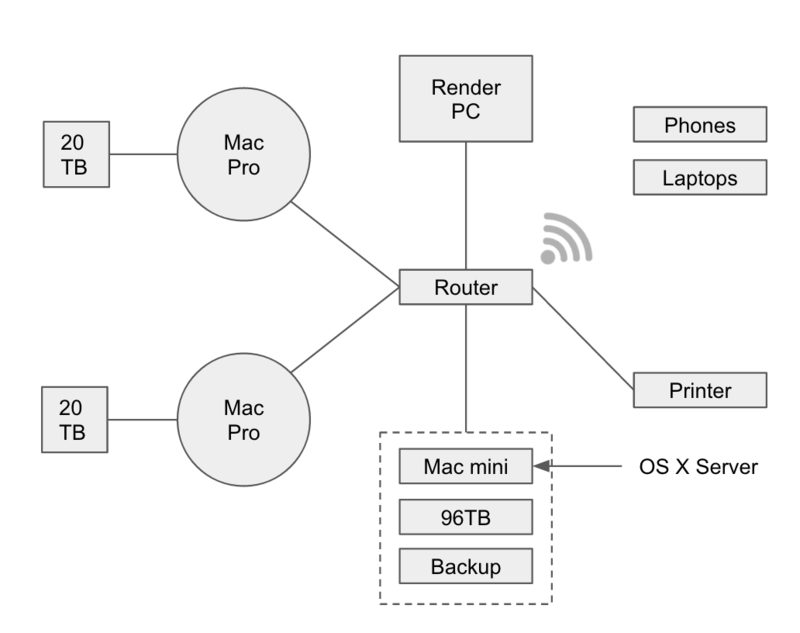 Click here for a detailed manual on how to set up your own Mac Mini server. When looking to buy a Mac Mini, look for a late 2012 model with an i7 2.3Ghz processor in it, since those work better as a server than the newer models. We then attached two LaCie 8Big 48TB disks as central storage units, because they are reliable, come with a super-fast Thunderbolt 2 connection, and are cost-effective (although still expensive as crap). They do make a ton of noise though, so we decided to house them in an acoustic server cabinet. We now use the two 20TB disks as messy working storage, and then organize the files into the aforementioned folder structure on the server, which everyone in the office can access. The final step to protect our income from catastrophe was to set up a proper backup system, because RAID 5 will not give you that guarantee. We already used the awesome Backblaze service to seamlessly back up our laptops in the cloud, but when you’re talking about terabytes upon terabytes of data, cloud is no longer a realistic option and the costs become prohibitive. That’s why we, like countless of media companies before us, had no choice but to go for LTO tapes. Tape sounds a bit old-school, but these things store up to 6TB of data for less than $50 each! LTO tapes are also the only long-term backup medium which are deemed reliable enough by insurance agencies. There are ultra fancy, ultra expensive LTO tape autoloaders, but we went for a simpler, yet still expensive, HP StoreEver LTO-6 Ultrium 6250 Tape Drive rack. People who have been following us for a while might know that we built our own 360º 3D camera rig two years ago. We open-sourced that camera design a while back, because we believed that better cameras from the established manufacturers would be out by now… unfortunately nothing is further from the truth. The only “professional” option at the moment is the Nokia OZO, but its small dynamic range, the huge price tag, and the massive stitch line in the image has forced us to stick with our own rig a bit longer. However, we already see that camera rental places are stocking OZO’s and will definitely stock other high-end VR cams too once they become available. So our tip would therefore be to not splurge too much on a new camera now, but just to rent one when needed. Owning a VR camera is not going to be your edge, it’s not ours either, you’ll have to come up with something better to set yourself apart. Besides a ton of new hardware, scaling up a VR company also forces one to look at alternatives in the field of software. We have been using Autopano Video Pro for a long time now, and Kolor is constantly improving the software, but as soon as your projects become a bit more complex you realize that Autopano is still very limited in its functionality. The main things lacking are the ability to composite in 360º 3D videos, previewing in an HMD, and to stitch using depth info instead of just pasting similar pixels together. The first tool(s) we looked into. Created by The Foundry, these tools are top-of-the-line, and ultra-professional. This combination of tools offers you unsurpassed stereo workflow and compositing capabilities, and is the only one of the solutions we tested that allows you to stitch using depth info. While all of this sounds great, it comes with a gigantic price tag of close to $20.000 (!) and a steep learning curve. This plugin adds VR compositing capabilities to the Adobe suite, which makes it a more accessible option. Skybox Studio allows you to preview your work in an HMD and makes it possible to add FX, texts, and logos to your stitched 360º footage. With a $189 price tag it is also much more affordable. Downside is that you still need Autopano to stitch your footage first. Scratch VR is a new tool from Assimilate, and has several unique features: Cloud Preview, so clients can preview your footage without you having to render and WeTransfer, and you can perform advanced color grading in an HMD so you can see what it will actually look like in an Oculus. However, the UI still needs a lot of work and you’ll still have to stitch using another program like Autopano. Scratch VR’s preview feature is a nice bridge to this next section about communication with clients, because we still notice that some of our clients have a hard time understanding the complexity of VR productions and the enormous file-transfer and render times that are an integral part of it. We just shipped 4TB worth of harddisks abroad with FedEx, because FTP and WeTransfer was just no longer going to cut it. And unless the internet becomes several orders of magnitude faster, we don’t really see an alternative yet. Also, the “just one small thing” emails are killing, because even changing a seemingly small thing like a name in the credits at the end of a 360º 3D video often means hours upon hours of re-rendering. We’re not working with Photoshop here, and we have to inform our clients in advance about this. That’s why a preview tool, like the one Scratch VR has developed, will become invaluable. We now also render videos as separate frames, so we can switch out a couple of frames without having to re-render the whole thing. The above mentioned underestimation of the complexity of a VR production led us to the decision to show “render time” on our invoices, just to make it visible to clients that this is something they should seriously consider before asking for changes. We also started out with 25% pre-payments on invoices, which would be fine if projects always ended on time and clients paid up quickly. However, this is rarely the case. We now ask for a 75% pre-payment, which at first sounded fairly high to me, but so far not a single client has refused. Do this if you want to be able to sleep without financial stress. Everyone and their mother are jumping into VR at the moment, and if you have some experience and a good portfolio, you’re probably being swamped by “would love to partner up” emails. The senders of those emails usually need your knowledge and technology, while they have little to give, apart from a promise to land you big ticket clients. It’s not actually that hard to get in contact with big brands if you’re working with cool technology like VR, so don’t let promises of introductions to corporates sway you too much. And if you do want to take the chance, let them prove it first by bringing you a big client who is actually willing to pay for your services. Another favorite seems to be the offer of access to their workforce; a very enticing offer if you’re a small startup with few employees and tons of complex projects in the pipeline. In reality though, their employees will already be in over their heads with their own work, making this another promise you should take with a grain of salt. While it does not cost anything to give someone credits for their work, we found that some parties have the tendency to “forget” to mention you. When this happens, we simply say our goodbyes and look for a more honest partner. Since we started two years ago, we’ve had several offers of companies who wanted to get a share in our company. While this could be your ticket to riches, we do want to warn not to take this route too quickly. It is perfectly possible to work closely together without handing over a part of your company, and therefore we always choose that route first. Similar to the previous point, you should be wary of companies who are too eager to get you to sign a contract, because this is often a sign that they are getting a better deal out of it than you. We understand that the world is based on contracts, and you should make clear agreements beforehand, but we prefer to find partners who can be trusted without lawyers and who we can drink a beer with on Fridays. The right partners can lift your business and the quality of your productions to new heights, but finding the right partner is not an easy task. I hope the previous section did not scare you too much 🙂 I understand it might sound easier than it is to say no to certain offers, assignments, and partnerships when you’re barely staying afloat financially. This is one of the main reasons why we would encourage you to find an investment; so you can stop worrying about the bills and have the luxury to say no to crappy offers. At the moment, we can pay for all our expenses and growth with the cash flow we generate from projects, but the buffer the investment created gives us the flexibility to take calculated risks and to move and grow quickly in this fast-paced market. Without it we would not be where we are today. You could also use certain clients as “investors” in your growth, by waiting for, or specifically looking for, a paying client who needs a certain feature or piece of hardware before developing it. This way, the client pays for the development costs, after which you have it laying on the shelves for a next one. Finding these “launching customers” is something which is a great way to fund your expansion without having to find an actual venture capitalist or give away shares. Another classic problem you will run into when your company grows is finding, hiring, and managing employees. My co-founder and I often say to each other how funny it is that problems never go away, but that the type of problems you have to deal with simply change. We expected it would be easy to find great employees, because who does not want to work for an innovative technology startup and play with the latest VR gadgets, right? Well, it turns out that finding an employee is not as easy as it sounds, especially a great employee, and job boards did not work for us at all. We found one employee by asking a teacher at a nearby university who his best student was, one from a Facebook group with young creatives, two through people we met during a shoot, and two who found our website and decided to shoot us an email. So be creative and prepare to use some guerilla tactics. The process of hiring someone was easier than we expected: we use a standard contract from the Dutch tax agency and simply send it over to our accountant, who then takes care of the rest and also handles the payrolling (don’t even think about doing this yourself). Do ask an HR expert for some quick tips before hiring someone, especially about the type of contract and its duration you should offer your new hire, because you don’t want to burn your fingers with legal issues. Managing employees is a lot easier if you focus on hiring self-sufficient employees who are able to take some initiative, which is again easier said than done 🙂 The project management tool mentioned earlier also helps to make sure everyone always knows what tasks still need to be done. We covered a wide range of topics in this article. Topics we, and many others, have to deal with when part of a growing company. We tried to share as many tips as possible, based on our own experiences, and hope you got something out of it. The final, and possibly most important thing I would like to share with you, is to determine your long term goals and to stay focused on them. 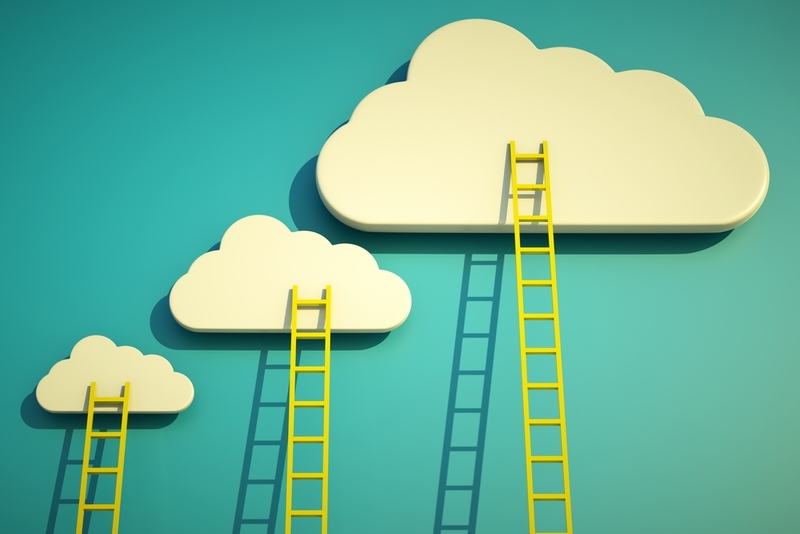 It’s super easy to get distracted by everything that’s happening in your company, by new projects and by demanding clients, but in the end the success of your company depends on your ability to reach your ultimate goal, whatever that may be. Huge respect for sharing this with us all – thx a lot ! Amazing Article, Having the same issues with my company, Its still few months old. Great overview, very insightful. Thank you for sharing. Many thanks for what you do guys !!!! All these articles are very very very helpful, You spend time to share your experience and knowledges with us, it’s amazing, thank you !!! !